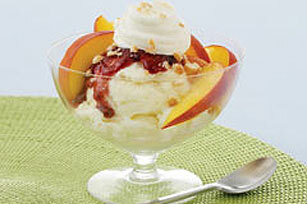 Dress up your dessert in just 10 short minutes with our Peach Melba Recipe. This Peach Melba Recipe combines ice cream and peaches in a most delicious way. Scoop ice cream into small bowl; top with peaches. Top with COOL WHIP and wafer crumbs. Sweets can be a part of a balanced diet, but just remember to keep tabs on portions. For variety, prepare using strawberry or apricot jam and/or your favorite flavor of frozen yogurt.